Fit for Success: Keep Your Diet on Track: "My Fitness Pal"
In today's society, I find it very hard to stay on track with a healthy lifestyle: Vending machines filled with candy and pop around every corner, coffee shops advertising greasy (and tempting) donuts and breakfast sandwiches, convenient pizza deliveries, chips and ice cream temptations at the grocery store, and desirable restaurants loaded with unhealthy (yet delicious) foods. America makes it pretty tough to comply with a healthy lifestyle, but if you can overcome this challenge, you will feel better than ever. Luckily, I really enjoy cooking, but I have always wondered about the content of what I truly eat in a day. 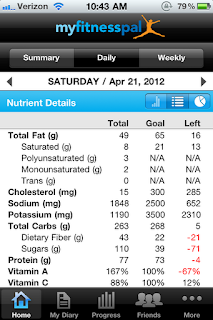 A few months ago, I was talking to a trainer who asked me how many calories/ grams of protein/ etc. I consume in a day. I had no idea! While I knew I was trying to eat healthy, I had no clue which area I needed to improve on. Cutting sugar? Increasing fiber? More protein? I was totally unaware of what I was putting in my body.... Until now!! 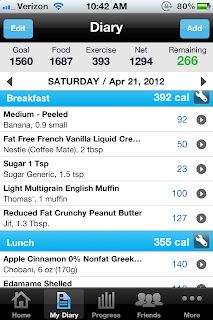 When I got the iPhone, I found an app called "My Fitness Pal" which gives you the tools to count all of the calories and nutrients you consume in a day. 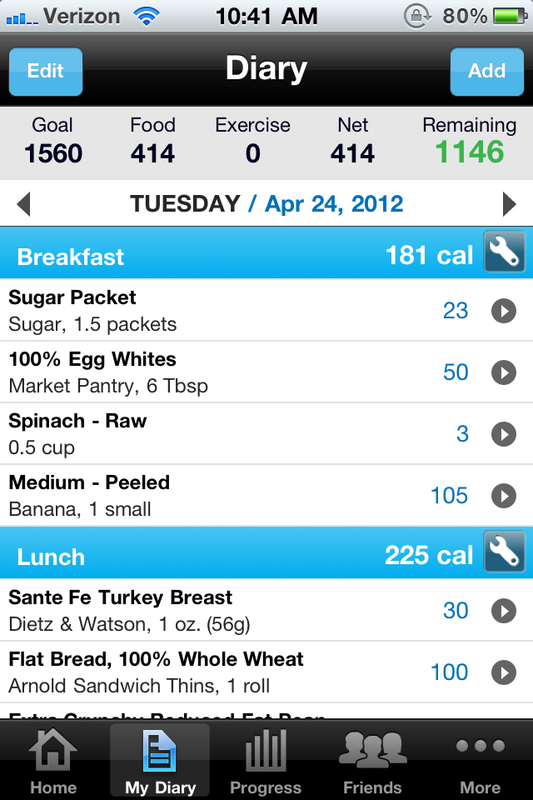 This was a great way for me to log everything I ate in order better determine what I needed to adjust in my diet! 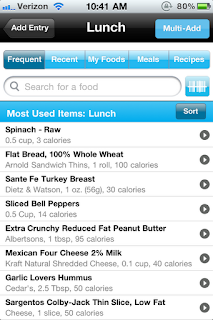 My Fitness Pal has just about EVERY food and ingredient you can imagine- from the grocery store, from restaurants, they have the nutrition information. It is SO easy to look up and log, and really helped me to understand what I was putting in my body. Best of all, it saves the "most popular" foods you eat, making your logging a quick and easy process. You can even change the "serving size" to the exact amount you consumed. This is an example of the "diary" screen. 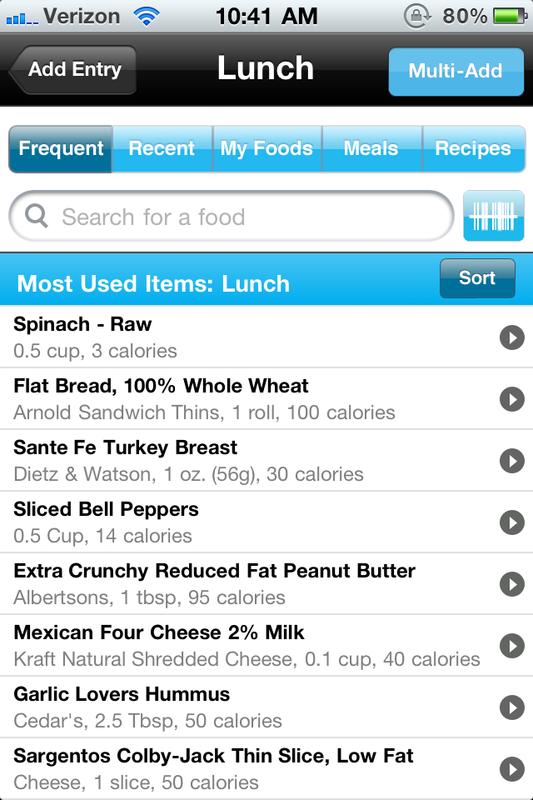 It keeps track of everything you consumed for each meal! another example! it saves my most popular food selections, and like i said, it contains EVERY food you can imagine! I never realized how much sugar I ate, and found that I needed to greatly increase my protein intake if I wanted to "tone-up". The trainer I spoke with instructed me to try to eat 1 gram of protein for every pound of your body weight, and My Fitness Pal gave me a way to keep track of this. 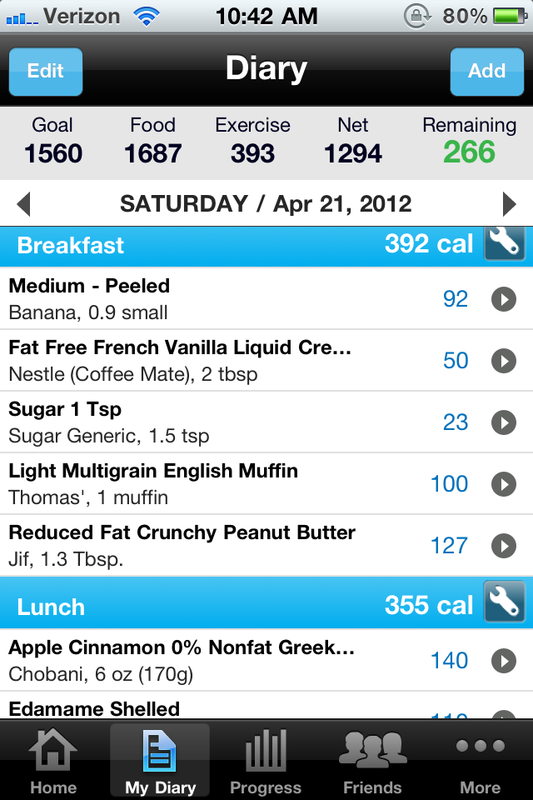 My Fitness Pal calculates every calorie, gram of fat, etc. that you consume throughout the day! As you can see, I had too much sugar this day (however, I ALWAYS go over on sugar!) 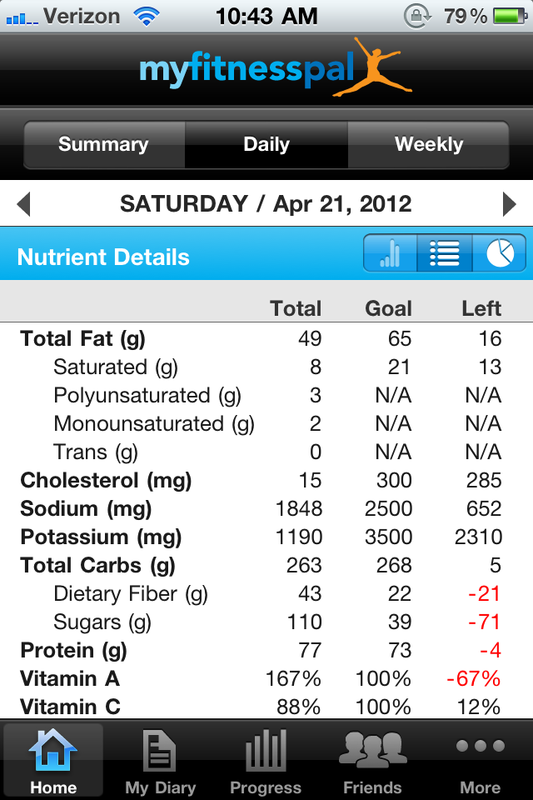 I ignore the fiber and protein limits because I am striving to eat 120 grams of protein per day! 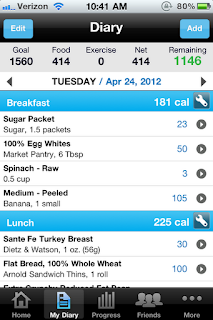 One thing I should add is that you don't need to log your meals EVERY day! You don't want to be obsessed about it, but it is a good way to see if you're staying on track with your eating plan and goals. Fitness is way of success.So try to fit.